Only a couple months into our first year of homeschooling and the negative comments had started. These weren’t really much different than what I heard when my kids were in a traditional school. We struggled through that first year, dragging ourselves to summer break. I don’t tell you this to discourage you, but to let you know it happens. I’m convinced it happens to all homeschool families at some point. I also want to encourage you to know what helped us in the years after the first struggles. I was a classroom teacher before heeding God’s call to bring our children home. I say heeding because God began to nudge us in the homeschool direction before our oldest was school age. By the time she entered Kindergarten, we had everything lined up for at least a short stint in public school. The next year a private Christian school opened and we decided this was what God really had in mind. Don’t we all do that now and then … give our own meaning to God’s call. The short story is after a few years, God shoved us in the direction of homeschooling. I quit teaching on Friday and began homeschooling on Monday. What I expected to be a heavenly experience was anything but. I questioned my teaching skills, my parenting, my sanity. I’m the type of person, though, who refuses to give up. So I approached September, our second year of homeschooling, with renewed determination. The year started out much like the previous year, I gave the kiddos assignments every morning, worked one-on-one with each one later, and yelled all afternoon, “No soccer practice until your school is done!” So much for determination. It turned into stubbornness. One day I felt defeated and told my children to do whatever; I didn’t care. I sat in my office defeated. Then I began to listen. My youngest son was trying to read a library book, and not doing badly. My daughter was practicing macrame for her class. My older son was working on his bike. Oh my goodness, learning was going on. They were carrying everyday life … and learning. This is when I discovered a learning way of life. It changed our homeschool; it changed our life; it changed everyone’s attitude. In two ways I became thankful. First, for finally listening to the details of God’s plan for my children’s education. Second, for listening to my kids and their learning. These children are now adults who continue to learn. Want to read more about a learning way of life? Head over to Minnesota Country Girl and read my story. 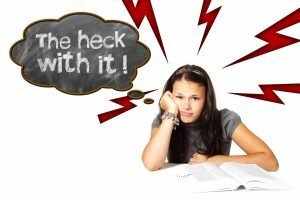 Are you not feeling so thankful about homeschooling? Maybe like me, it’s not the bliss you expected. The Harried Homeschooler’s Handbook may be just what you need.